Days of Wonder brings you the digital android version of Splendor, the popular board game everyone loves. The game is simple enough with clear visual cues. 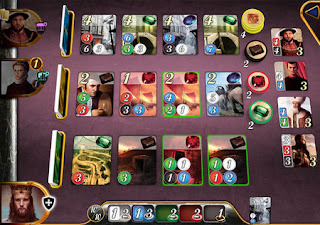 Download Splendor Apk v1.1.4 today and compete in single player mode against the AI, local pass-and-play multiplayer, and single player challenge modes with variant rules. - Official adaptation of the board game created by Space Cowboys. - Lavish graphics, true to the original game. - Solo mode and pass-and-play mode, 2 to 4 players. - New game mode: scenario-based “Challenges” to learn advanced techniques or just have fun with rules tweaks. Historically-accurate background stories for Challenges set in the 15th to 16th century period. - Excellent interactive tutorial to teach the game and digital interface. - Worldwide leaderboards by connecting with a Days of Wonder account. This new update of Splendor also introduces a complete new game mode: Duels. Duels are Challenges that you play against an AI. 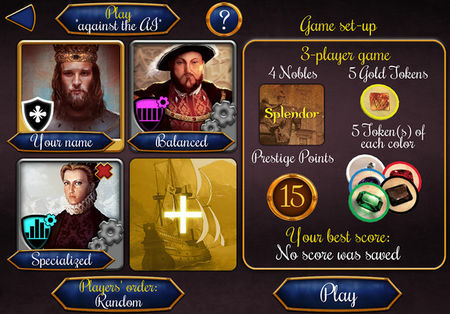 The update provides two Duels, one against the Emperor Charles V and another one against Mary Stuart. The London pack introduces a new Challenge mode, which involves capturing a specific combination of card colors on the board. 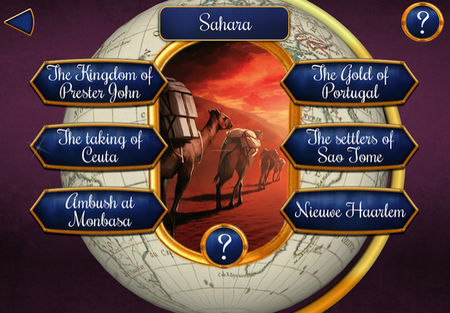 In terms of difficulties, the London pack is more difficult than any of the previous packs that released in Splendor. Install Apk, Copy ‘com.daysofwonder.Splendor.gp’ folder to sdcard/Android/obb, Launch the Game and play.